Hunters come in all shapes and persuasions. And most of us don't want or need to kill predators in areas designated as national preserves. Unfortunately, the state of Alaska, with help from the Trump administration and our congressional delegation, is seeking to overturn a federal regulation that prohibits several hunting practices in preserves that most people would consider contrary to the principle of fair chase anywhere. National preserves were created in Alaska by Congress, which chose the National Park Service to be the managing agency. Anywhere else, these preserves would have been national parks, but Congress — recognizing that Alaska had more than its share of parks and a still-vibrant hunting culture — chose to make these areas preserves so that hunting could be preserved as well as the wildlife that hunters pursue. Nevertheless, like national parks, preserves were to be managed to maintain natural and healthy populations of all wild animals, to be intact, fully functioning ecosystems. Preserves were never intended to be game farms for lazy or inept hunters. I've been hunting for more than 50 years. I've hunted woodcock and ducks in Missouri and sage grouse and blue grouse in Colorado. I've hunted moose, caribou, deer, Dall sheep, snowshoe hares, ptarmigan and grouse from Southeast Alaska to the Brooks Range. I shot my first moose with a 20-gauge, single-shot Winchester Model 37. Come to think of it, I shot my first caribou and deer with the same gun. My father gave it to me when I was 13 years old. I still have it, of course. Hunters are no more alike than sports fans. We have thousands of intersecting levels of aptitude, interest, knowledge, experience, discretionary income, free time and ethics. Most of us don't hunt bears or wolves, although we see no harm in others giving them fair chase. Most of us don't mind having some areas, like national parks, that are off-limits to hunting. Most of us don't hunt every local game animal every year. Most of us realize that meat obtained by hunting is seldom less expensive than meat from the supermarket. But it's different meat. It's untainted by drugs, supplemental growth hormones and pesticides. And it's wild, which means we are still a little bit wild. Most American hunters are white men, but hunters are found among all races. Increasingly, women are joining our ranks. Most of us think that's a good idea. My wife is a hunter. My eldest daughter is a hunter. I know many hunters. So when politicians, bureaucrats and their lickspittle spokespeople try to tell us that hunters want to – that they need to – shoot more predators in preserves managed by the National Park Service, I know that's not right. Alaska Department of Fish and Game Commissioner Sam Cotten was being disingenuous when he declared in a May 22 press release that "the state does not conduct predator control in national preserves" and that "the state would be allowed to conduct predator control in preserves only with Park Service authorization." That's not strictly the truth, and the reason is buried in the same press release. According to Mr. Cotten, "wildlife harvests under general hunting regulations aren't part of predator control." General hunting regulations have always been used for predator control. Problem is, it isn't very effective. Who wants to shoot bear cubs for sport? Well, it turns out there are a few hunters who really don't like predators. So, in recent decades, the Alaska Board of Game has made it easy for those hunters, in some areas, to shoot two brown bears per year. A hunter can sell brown bear skulls, hides and claws. That used to be condemned as market hunting. They can hunt brown bears over bait, shoot black bear cubs or sows accompanied by cubs, shoot bears in dens using artificial lights, and shoot wolf and coyote pups during the denning season. They can use a snowmachine to "position" a wolf or wolverine before shooting it. All of these practices were considered almost unthinkable when I started working for Fish and Game in the early 1980s. But even those practices aren't all that effective at reducing predator populations. So Alaska also practices predator control, where employees or agents of the state capture and kill bears with foot snares and shoot wolves and bears from airplanes and helicopters. That can be quite effective in some areas. Even in national preserves. 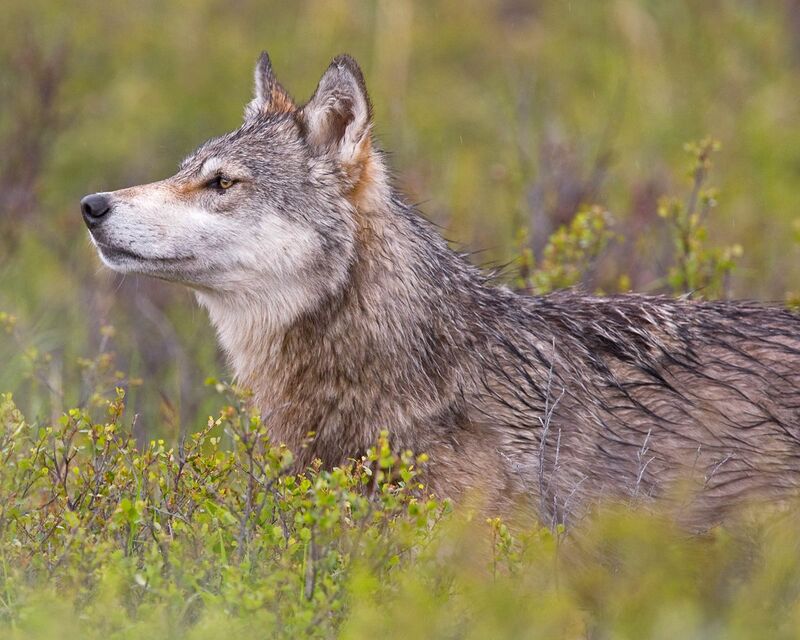 For example, a 22-year study in the Yukon-Charley Rivers National Preserve found that the state's wolf control activities outside of the 2.7-million-acre preserve reduced wolf survival rates inside the preserve. That's because wolves must roam widely to find food, and they don't recognize boundaries drawn on maps. The park biologists had to terminate the study because so many of their radio-collared wolves had been shot outside of the preserve. In contrast to Alaska's unique "intensive management" law, which requires the state to kill predators to produce more moose, caribou and deer for hunters, the NPS is required by federal law, custom and the desires of most Americans to maintain healthy and largely undisturbed ecosystems, including predators. Fish and Game was dragged kicking and screaming into this mess by state politicians who ignored most of their constituents. The intensive management law enacted in 1994 has been used, slowly but surely, to justify certain "general hunting regulations" and predator control practices that were anathema to state wildlife managers between statehood and the 1990s. Before the intensive management law, most wildlife managers and hunters subscribed to fair chase. I'd argue that most managers and hunters still do. Fish and Game used to promote fair chase. You don't hear much about that any more. Alaska politicians and bureaucrats are increasingly attempting to normalize unfair hunting practices in the name of intensive management. That law has to go. But first, let's all agree that the politicians, bureaucrats and spokespeople who are forcing the National Park Service to overthrow their own regulations are not speaking for all hunters. They represent a minority of hunters, which are a minority of the American public. Wildlife belongs to all of us, hunters and non-hunters alike. If you'd like to be heard, comments must be mailed or hand-delivered by July 23 to the National Park Service, Regional Director, Alaska Regional Office, 240 West 5th Ave., Anchorage, AK 99501, or online.